Well, this is my 601st post! Hurray! Thanks to all my regular readers and visitors who have kept this blog going, challenged and encouraged me!! The Annapoorna Hotels at Coimbatore are the masters of making distinct varieties of masala roasts. One fine day, my memories went back to eating paneer masala roast and many other masala roasts in Annapoorna, Coimbatore. So I tried the same at home and it was a big hit. I don't know if it is made this way or I won’t say it tasted 100% like that, but I can say that this was close to it. This is just my way of creating the nearest match of Annapoorna peas masala roast from my memories. 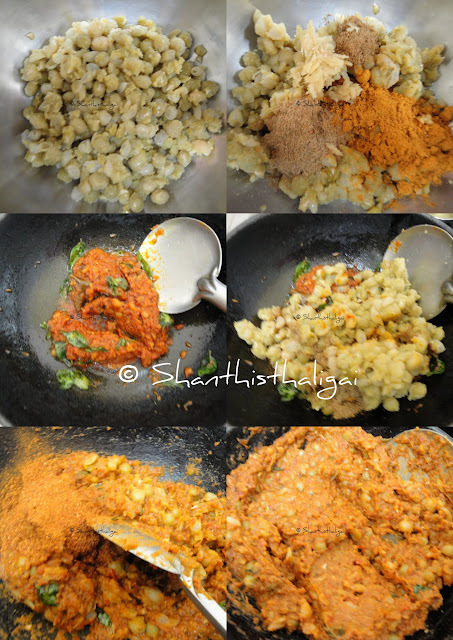 Now, let's see how to make this peas masala roast with step-wise pictures. Soak dried green peas overnight. Pressure cook soaked peas alongwith salt for 3 whistles with enough water. Drain the water. Keep aside. Grind the tomatoes to a paste alongwith green chillies. Heat little oil add curry leaves turmeric powder and tomato paste and fry until oil leaves the sides. (If using onions, chopped onions can also be added before adding the tomato paste). Meanwhile, mash cooked peas slightly. Add all other ingredients, mix well and add to the tomato paste. Cook until the raw smell diffuses and thick. (I used ginger paste. If using garlic, ginger-garlic paste can be used instead of ginger paste). Add chopped coriander leaves and mix well. The masala is ready. HOW TO SPREAD: Spread the dosa batter in a dosa pan. Drizzle oil/ghee on all the sides and when one side is cooked, flip it to the other side. Leave it for 10 - 15 seconds. Again, flip it to the first side. 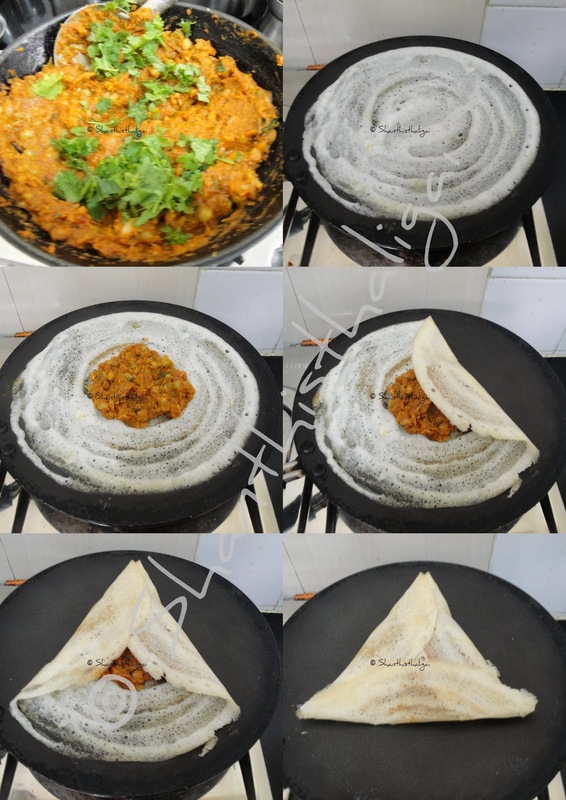 Place a ladle of masala in the centre and fold as shown in the picture, to get a triangle. Serve hot with any chutney or sambhar or your choice. NOTE: The masala should be semi-solid. This masala can also be used as a side dish with pooris and chappathis. Looks yummmm!!! love that fold! !